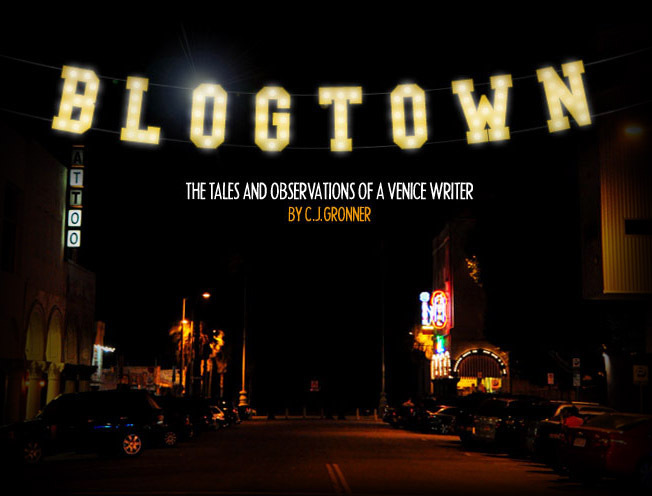 Blogtown: Abbot Kinney Street Festival 2014! We look forward to the Abbot Kinney Festival every year like it's Venice Thanksgiving. Old home weekend style, as you finally see all the old school friends that have been hiding out and avoiding Abbot Kinney these days when it's much harder to recognize as Venice there. But the Festival brings us all back, brings us all together ... and that's why we love it. This year was its 30th anniversary, so it felt extra-special. You couldn't ask for a more perfect Festival day, bright blue skies, high puffy clouds and a slight breeze to refresh you in the sunshine. It all started real early, as we awoke to the sound of poles clanging as they set up booths in the wee hours. When you start to hear the live music wafting inside your windows, it creates a sense of urgency to get out there and let the fun begin! This year - FINALLY - we had a dedicated stage (curated by Matt Ellis) for local music at Andalusia. That became our headquarters for the entire day, as every artist playing was a dear friend, thus it was by far the place to be (So much so that I didn't really see all that much else at either end this year, as we were smack in the center of it all). It kicked off with a performance by our Venice Symphony Orchestra, which I JUST missed, but know it was great as always. Lacey Kay Cowden played so beautifully that I heard a lady say she'd heard the music from a few blocks away, and headed right in our direction. Once there, she was so mesmerized (like we all were) by Cowden's resonant voice, that she said she completely forgot there was the entire ruckus of a street festival right behind us. That's a good review. Blue Eyed Son was a perfect fit for the day, as his surfy tunes put a spring in your step automatically. It also made us want to party. Which we proceeded to do ... all day and night. I took a little stroll to see what was what, and was happy to see that Beyond Baroque again had their Spoken Word stage set up, with Venetians and friends getting up there to express their souls to anyone who happened to be there taking a breather. Poetry lives! The fine folks at Trim were all American Hustled out, with glam 70's looks and $20 hair cuts all day, keeping their fun theme tradition alive. The morning attendance seemed a little more sparse than usual, I think people had big nights the night before. That soon changed, and before long, you couldn't walk two feet without bumping into a familiar, friendly face. That's the best part of the whole festival, seeing your homies all together having fun in the place that we all love. The next best part might be the annual parade of the Samba school and drum line that always struts their stuff down the middle of the festival. It's so happy, such a celebration ... everyone just stops in their tracks and shouts and dances along. What a beautiful tradition. Next up on the Andalusia stage was Paul Chesne, our favorite local raconteur/tireless showman. He fired up the people, as usual, and showed why he's booked like 300 nights of the year all around Los Angeles. 'Cause he's the best. 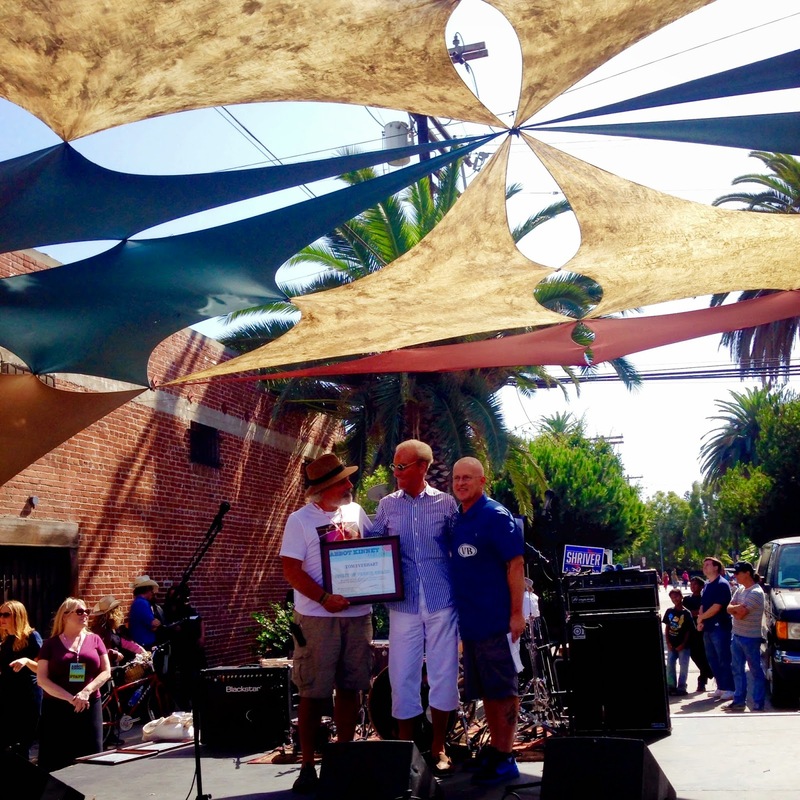 ... the Spirit Of Venice awards (and grants) were given out back at the Andalusia stage, where artists Ed Moses, Laddie John Dill, Tom Everhart, activist Mariana Aguilar, VNC's Eduardo Manilla, and a post-humous award for skater Jay Adams all received their Venice props. Also keeping it very Venice were the Hecho en Venice and Dogtown booths, where there were lines all day to buy the gear that has always shown their local pride. Next up at Andalusia was Matt Ellis and his band. Andy Clockwise was the guest drummer, and they demanded and held the attention of pretty much everybody walking by. We sang along, we danced, we felt really grateful that this much good music is available to us all the time here in Venice, most every night of the week. A little more strolling ... lots of jewelry booths, some new big, cool wings for kids to wear, clothes, t-shirts, bags, hot sauce, art, art, ART ... if you couldn't find it at the AKF, you probably won't. We made sure to get back over to Andalusia to see Venice's own Tom Freund close out the local stage, playing songs from his great new Two Moons album (also set mostly in Venice). Freund and his band (Adam Topol! Jessy Greene! Gabe Noel! Rami Jaffe!) brought their international level talent to our own backyard, and it was a sublime time in the sun with all of our friends. As was the entire day, really. The party kept going long after the police did their sweep to clear everyone out. I saw that the beer garden at The Brig was still going strong when we had to gather our wits and head to Hollywood for the excellent George Fest. Phew! What a great day in Venice. Social media and word of mouth blew up with people talking and sharing photos about all the fun they had at #AKF2014, as this year's t-shirts read. Very timely. I could go on and on about it all ... but it really comes down to just this every time: I LOVE YOU, VENICE! sister cj!! beautifully written and AMAZING photos!!! I felt the joy of the samba gals and it made me want to do it all over again! Luckily we are living the dream of venice and we can make another ruckus this sunday. Music and all. Thank you wonderful woman!